The end of the world approaches, first target: Stephenville, Texas. This rural community has been plagued by visits from a low flying, brightly-lit object that runs silently across the night sky, bewildering the lowly humans that witness its flight. Steve Allen, a freight company owner and pilot reported that the object was a mile long and a half mile wide, â€œIt was positively, absolutely nothing from these parts,â€ he said. Other locals who saw the aircraft swear that it was larger, quieter, faster and lower to the ground than a terrestrial aircraft. The January 8, 2008 appearance of the craft was possibly not the first. Ricky Sorrells said that he has seen the object on more than one occasion as it hovered over his pasture near his home. On one occasion, Sorrells watched the UFO through his rifleâ€™s telescopic lens and describes the object as being very large and without seams, nuts or bolts. Maj. Karl Lewis, a spokesman for Forth Worth Naval Air Station, stated that there were no aircraft from his base in the area on the night in question. â€œIâ€™m 90 percent sure this was an airliner,â€ Lewis said, â€œWith the sunâ€™s angle, it can play tricks on you.â€ The two neighboring Air Force bases also report that none of their aircraft were in the area last week. So keep your eyes on the sky Texas, we are counting on you to raise the alarm when the space aliens arrive to eat our brains. 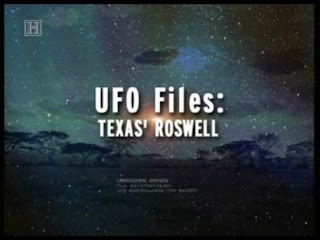 3 users commented in " Headlines: UFO Invasion in Texas "
You better believe it. We have been getting ready for this event for quite some times and those sci fi shows on TV were designed to tune you in that we are not the only beings in the universe. 2012 is only a few years away and I believe that we will finally get to know the true face of God or the Gods. Their are over 200 UFO reports a month in Americaand literaly thousands around the world. Is all of these people crazy? I think not and I believe that Zacharia Sitchin and his Earth Chronicle books are very close to the real truth. I wonder why UFOs tend to appear in areas where people tend to be less educated, all around the world. Just the Drake equation and scientific common sense tell us that there is a good probability of finding life in other solar systems but if aliens really come here, would they always choose to interact with the less-educated after crossing all those parsecs of empty space? Maybe if that is the case, is one of their cultural traits, but seems odd, given that they would need to have some sort of analytical minds in order to build and steer spaceships and rationally speaking, that would lead to the need of speaking to someone interesting on arrival. In other words: would Columbus have spoken to some lowly Indians or would he have preferred to speak with a local king or chieftain?